Clearly iStamp: The word for the day is.....NEW!!!! I guess it could also be EXCITING! This is Kathy D. and I know I'm EXCITED to announce all the NEW stuff we have going on this month! Lori is busy behind the scenes, trying to put the finishing touches on the store, so she asked me to let you know about all the EXCITING changes coming! Yes, we are moving to a new store tomorrow, 05/15/2013, which brings a ton of EXCITEMENT....BUT we also have other NEW stuff to reveal to you! As you will see when you get to the new store, our store is now named Clearly Digi Stamps! Since our primary focus has become digital stamps, we thought it was time we hang a new "sign" saying that! Don't worry, you will still get the same awesome customer service and wonderful DT samples for inspiration!! We have also added a few new DT members - Jennifer Dunn (she is returning to the team because she missed us soooo much!! ), Deanette Wooster, Dee Pritschet and Carrie Robinson. I'm sure you will enjoy seeing their creations as much as I do! Patrick Dunnegan of DunnitAgain Designs! Yep, you guessed it...he is my better half! He is an amazing artist...yes, I know I'm biased...but he REALLY is!! What better way to introduce him then to show a card using one of his images, Dragons, that will be released TOMORROW in the NEW Store. Kathy D. of DunnitAgain Designs! Since the old store is in the process of being taken down and the new store is getting prepared to launch TOMORROW with NEW RELEASES we decided what better way to spend our time waiting then playing in our craft rooms! So here is a ONE DAY CHALLENGE for you. Any kind of celebration will work! Also, it doesn't have to be cards...it could be a gift you made for a celebration, decorations you make for a party, scrapbook pages showing a celebration, etc. Get creative! I can't wait to see what Celebration you pick!! Here is a sample from Nancy Perry our Guest DT Member. 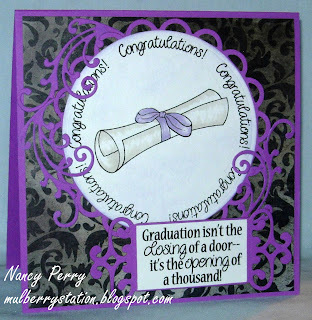 She won our National Scrapbook Day Challenge so she will be playing with us through June! Challenge runs from 12:01 am - 11:30 pm today, 05/14/2013. What a wonderful challenge! Looking forward to your new store! Ok Kathy. You got me again! Your excitement is contagious! Thanks for the heads up on excitement at your blog site. Entered. Look forward to more. So excited to see the new changes! Congratulations! I entered a little frog birthday card I did. The digi is from you and I used washi for color! Thanks for another great contest! Fun challenge. So glad I saw your comment. Looks like there is lots of fun ahead with all the fun surprises. I am looking forward to it! My card is a birthday card. The words 'thank you' were a cut & paste error.